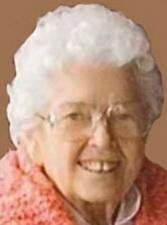 WATERLOO, IOWA — Grace W. Akin, 96, of Waterloo, died Wednesday, November 25, 2009, at Covenant Medical Center of natural causes. She was born October 6, 1913, in Dinsdale, daughter of Leslie E. and Mary Bicket Stark. She married Ethan O. Akin on Aug. 25, 1935. He died in 1982. Mrs. Akin graduated from Grundy Center High School in 1930 and graduated from the University of Northern Iowa with a bachelor’s degree in art in 1967 at the age of 54. She was primarily a homemaker and also assisted her husband with their vending business. Survived by: two sons, E. Thomas (Mary) of Cedar Rapids and Philip D. (Claudia) of Waterloo; two daughters, Marilyn J. (John) Orth of Greeley, Colorado, and Kathie Jo Jackson of Frederick, Colorado; 11 grandchildren; 20 great-grandchildren; and two sisters, Marjorie Fritzel of Wellsburg and Evelyn Heltibridle of Waterloo. Preceded in death by: her parents; her husband; a great-grandson, Jason, in infancy; a sister, Gladys Verly; and two brothers, Richard Stark and William Stark. Services: 10:30 a.m. Saturday at Westminster Presbyterian Church, Waterloo, with burial in Waterloo Memorial Park Cemetery. Public visitation from 4 to 7 p.m. today at Parrott & Wood Chapel of Memories, an Overton Family Service. She went to college to study art because she possessed both the desire and the opportunity to attend. Grace’s passions were art, music, reading and writing beautiful poems. She loved to go out and sketch the world around here wherever it could be found. She was a member of the Waterloo Art Association and the Westminster Presbyterian Church, where she had taught Sunday school and was a member of the choir. Source: Waterloo Courier, Friday, November 27, 2009.